The Netherlands is famously flat—but a massive green mountain is rising up in the Dutch city of Veldhoven. 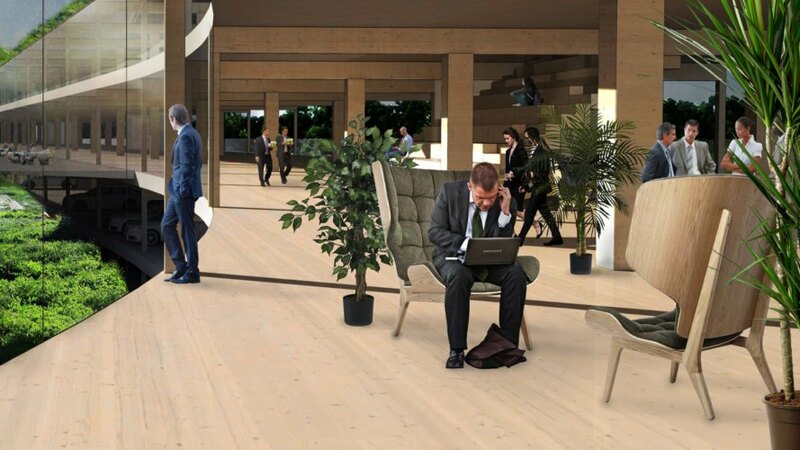 The Dutch Mountains project will be the world’s largest wooden building, combining natural materials with high-tech design to create a state-of-the-art, self-sustaining development. The ambitious project will include several offices and work spaces, as well as various conference centers. It will also feature a hotel located on site and short-stay facilities for out-of-town visitors. The main building will be constructed of solid wood and, once completed, will be the largest wooden building in the world. The Dutch Mountains master plan envisions an entirely self-sufficient complex, with closed cycles for energy, water, waste and materials. The architects chose timber as the principal building material in order to create system that reduces CO2 emissions. Additionally, they plan to integrate the building’s facade with a smart technology that reduces energy usage. The project envisions a future where the building can be updated with greener materials that help improve the building’s sustainability. For example, the building’s temperature-regulating facade will be one of the most innovative on the market, but if a smarter facade is created in the future that produces more energy, it can easily replace the old version, which will be recycled or repurposed. Built with optimal flexibility in mind, the structure’s individual spaces will be adaptable to future uses. For example, if more office space is needed, the conference spaces can be converted, or vice versa. The complex will not only use sustainable building materials, but also provide an abundance of green space to create a vibrant, healthy atmosphere. 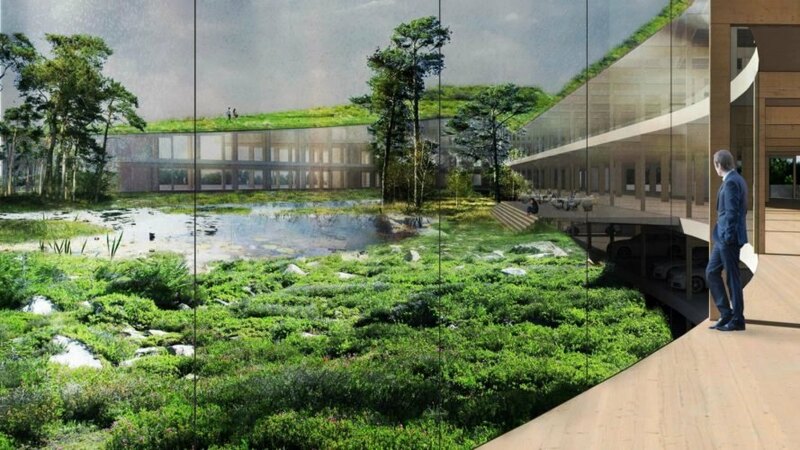 From green roofs and a large park to an artificial marshland, the complex will be virtually covered in vegetation. A vibrant new urban design project in the Netherlands is combining the best of high-tech design with sustainable building materials to create a state-of-the-art, self-sustaining development. 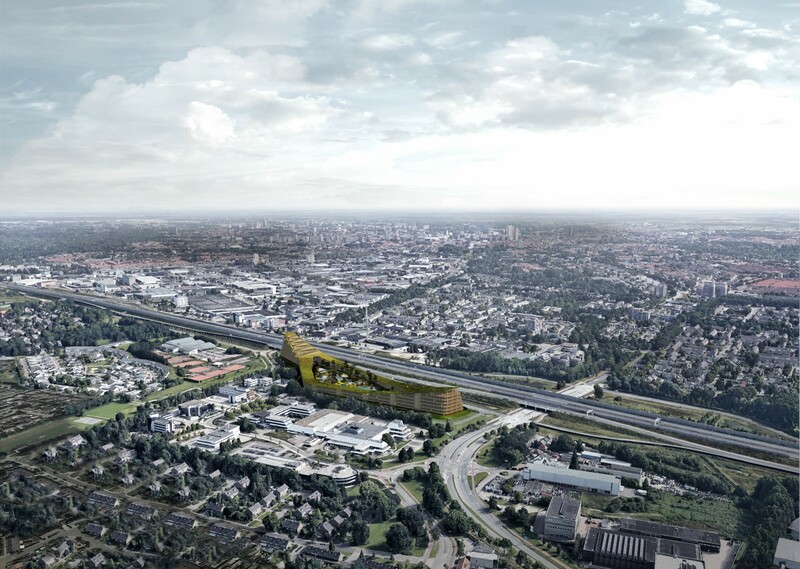 The Dutch Mountains project - slated for the city of Veldhoven - will integrate natural materials and innovative technology into what will be the world's largest wooden building, clad in a smart facade with multiple open-air spaces and covered in an abundance of vegetation. The ambitious project, which is slated to open in late 2021, is a residential and professional complex that will include offices and work spaces, as well as various conference centers. The project will also include a hotel located on site, as well as short-stay facilities for out-of-town visitors. The main building will be built with solid wood and, when completed, will be the largest wooden building in the world. envisions an entirely self-sufficient complex, with closed cycles for energy, water, waste and materials. The architects chose timber as the principal building material in order to create system that reduces CO2 emissions. 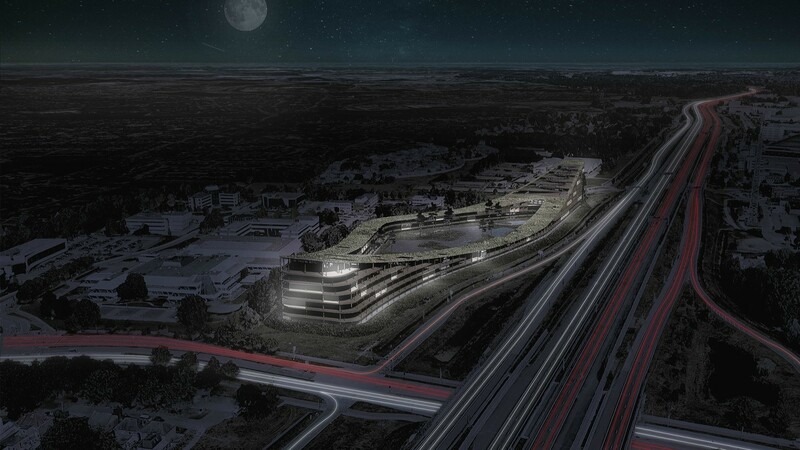 The Dutch Mountains Project will be constructed with high-tech sustainable features. 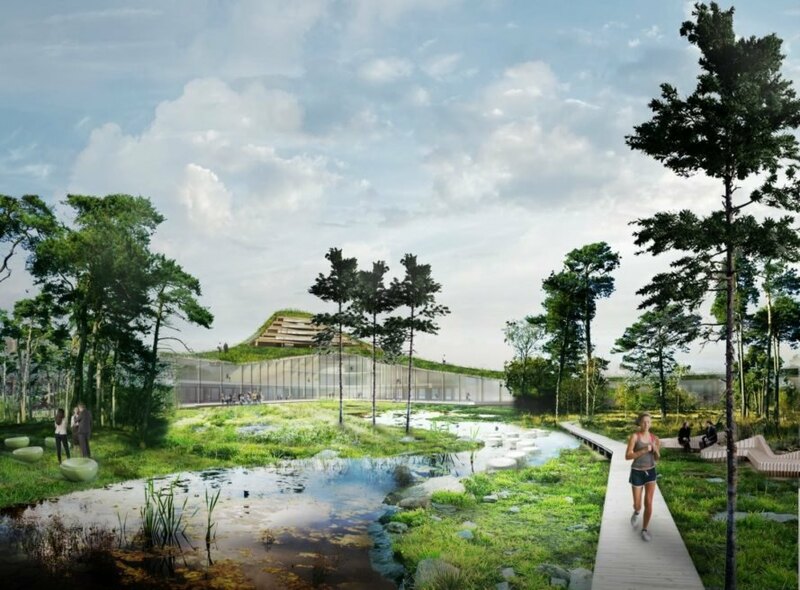 The complex will not only use sustainable building materials, but also provide an abundance of green space to create a vibrant, healthy atmosphere. 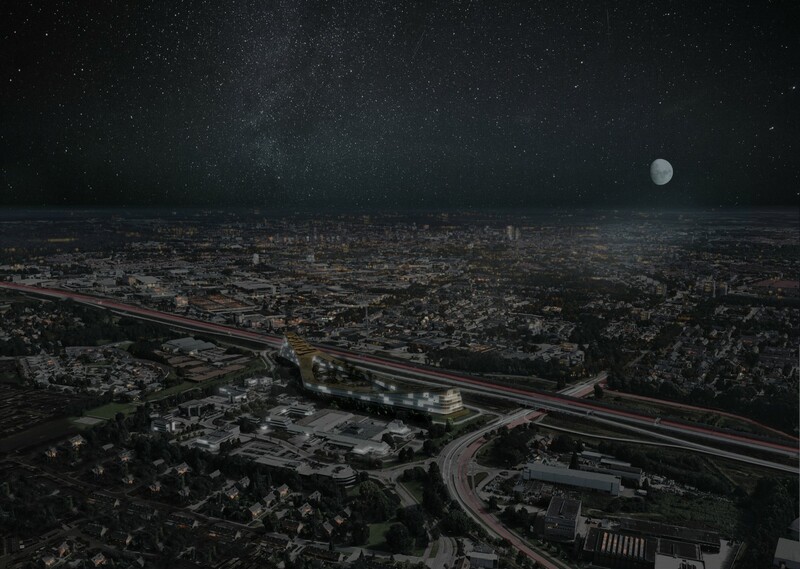 The Dutch Mountains project is slated for completion in 2021.